Laboratory film used to prevent evaporation, contamination and hydration. Seals labware quickly and efficiently. Used in EM for drop staining and to pick up thin films when coating grids. See recommended dispenser 70993 series below. Store, dispense, and cut Parafilm®, tape, labels, and Tough-Tags. ABS plastic dispenser designed with a safety razor that slides and cuts with no danger to your fingers. Dispenser holds one or two 2-inch rolls, or one 4-inch roll. Parafilm is a registered trademark of American Can Company. Water Vapor 1.0g/100in2/24 hrs at 38°C and 90% R.H. It Clings – Film can cling to itself and glass vessels. Heat Resistant – Softens at 100°C. Strong – Film can stretch 300-400% before breaking or tearing. Tight Sealing – Forms and air tight barrier when stretched across openings. These eco-friendly, rapidly degradable containers are one of the most innovative specimen containers on the market today. Plastics take hundreds of years to degrade naturally in the environment, while the only condition necessary for these to biodegrade is constant contact with other degrading material. No heat, physical stress, oxygen or sunlight are needed for product breakdown. They have the ability to break down safely and quickly, by biological means, into the raw materials of nature and disappear into the environment. They will biodegrade to become some of the soil's organic components in less than 7 years in constant contact with the soil, instead of up to 400 years as conventional plastics. Available in three sizes: 60, 90 and 120 ml. 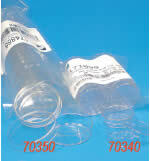 These containers are for applications needing the utmost security and where sample integrity is of high importance. 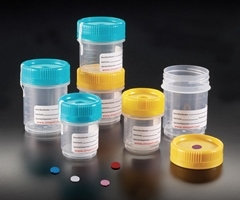 A great feature of the Spectainer™ I is that it incorporates a unique tamper evident screw cap, ensuring peace of mind during transport or storage situations where someone could tamper with the specimen. Screw cap on until a clicking noise is heard. This is when the plastic ring is firmly seated and locked over the container threads. When removing the tamper evident screw cap for the first time, the perforation is severed, thereby ensuring easy recognition that the container has been opened. Both containers and caps are manufactured without the use of plasticisers or mold release agents. All material used is free from latex. Containers are 95kpa compliant. Available in three sizes: 60*, 90 and 120 ml. The sterile container protects its sterility with a tamper evident seal. *The 60 ml size is not graduated. This model uses a conventional leakproof screw cap. It is designed for collection, transport and storage of specimens, the polypropylene containers are safe to use even in adverse conditions. Containers are uniquely stackable, shatter resistant and are manufactured from virgin high-clarity polypropylene. They are designed with a straight side format. Containers are easily and safely stackable. Available in three sizes: 60*, 90 and 120 ml. 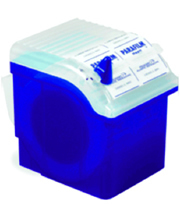 Container made of polypropylene – Closure made of polyethylene. This shatter resistant, especially designed for collection, transport and specimen storage. Both containers and caps are manufactured without the use of plasticizers or mold release agents. All material used are free from latex. All containers are 95kpa compliant. Non sterile, container and caps are packaged separately in bag of 100. This model uses a different tamper evident concept compared to the SecurTainer I above. No locking tab to push up is necessary when the tamper evident is used. Simply screw the cap on the container and the tamper evident sealing ring is automatically locking in place. When unscrewed, the ring is detached from the cap. All other features are the same as SecurTainer I. CapInserts are available in assorted colors. This is a space-saving expandable accordion-style jug with flattens down for easy transport and storage. Great ideal for storing and carrying numerous types of fluids, it is suitable for any laboratory. Made of high strength polyethylene, it features comfortable carry grip and screw-on cap with on/off spout. It is available in many sizes up to 8 liters. Come with individually wrapped. Acrylic, modular tray for specimen transport. Facilitates safe and efficient transport of prefilled specimen containers. Integral handles allow for easy and safe transport. Accommodates 20 ml, 40 ml and 60 ml prefilled specimen containers. Easy to Use – Label Petri dishes quickly, neatly, and reliably. Ideally Sized – PetriStickers™ are 3" or 76 mm diameter. Prevent Fatigue – 30 angle creates a more comfortable work surface for streaking, transferring, and counting. Unique Design – Rear slot accepts all PetriOrienters to create a custom layout. Accuracy – Quickly create a consistent area of reference on your petri dish. Clarity – Sharp characters and lines allow for fast and easy position recognition. Flexible – PetriOrienters are available in several layouts of grids or pie sectors to accommodate colonies of any size. Ideal sealing Tapes for Petri Dishes, Microplates, Lids, Caps and other Lab Items. Enjoy all the benefits of PetriSEAL and ContainerSEAL in a new wider format. Container SEAL XL makes it easier to seal large containers and bottles and to cover wider gaps ensuring a tight seal. Vertically Oriented Support Structure for Sealing Petri Dishes. Provides An Extra Hand – Support N Seal provides a stabilizing vertical slot in which the Petri dish and lid are held closely together while allowing rotation as a sealing tape is applied around the dish. Any Tape Any Time – Compatible with most sealing tapes including Breathe Easy Breathable Strips, PetriSeal, DuraSeal and Parafilm®. Stable – A wide base and non-slip feet ensure that Support N Seal remains in place while in use. 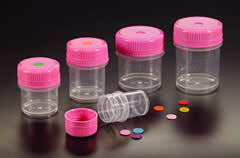 Universal – Fits Petri dishes up to 100 mm in diameter and 15 mm high (including lid). 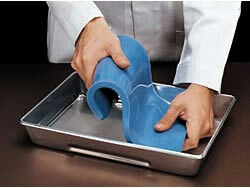 Seal-To-Size Polytubing for Petri Dish Storage. 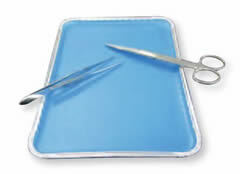 Cut-To-Size – Petri-Sleeve™ can be sized to accomodate any number of Petri dishes. Minimize Waste – Each length of sleeve can be sized to prevent baggy packaging and prevent excess waste. Separate Storage – Petri dishes pretreated prior to use can be stored labeled and stored in separate sleeves to prevent contamination. Labeled Stacks – 3" white squares every 6" allow for easy, high contrast labeling. Versatile – 7" diameter easily fits a wide variety of popular dish sizes, as well as microplates. Our Petri Dishes are available in a variety of shapes and sizes for use in routine procedures and with automated equipment. Economical, optical clarity, dishes are precision-molded from biomedical grade polystyrene so cultures are clearly visible without distortion. Dishes are packaged 20 each in sturdy polyethylene sleeves. These dishes are not recommended for tissue culture application, due to non treated by "corona effect". These dishes are free from optical distortion. The dish has 16 of 10 x 10 mm square grids, which is marked numerically in one direction and alphabetically in the other. The model 70692-20 is designed with a convex bottom to save on culture medium. Dishes are packaged 20 per sleeve and are radiation sterile. This dish commonly referred to as a 100 x 15 mm dish. Free from optical distortion and sterile, these dishes are ideal for phase typing, susceptibility testing, plate counts, and probe assays. A silicone pad placed inside a 150 mm x 20 mm deep plastic petri dish. The mat can be removed, washed, and returned to the dish for reuse. The pins come in 10 different coded colors. These flat, clear dishes will withstand repeated sterilization (wet or dry). The edges are beaded to provide greater mechanical strength. The bead also provides a means to equally space the sidewalls of the bottom and cover, thereby reducing the capillary action of condensed moisture on the slides. They are not effected chemically or thermally by any of the methods commonly employed in laboratories where sterilization is a major factor in routine or in specialized work. The covered dish is not airtight. The tops are marked in blue enamel and the bottoms are marked in white enamel to make sorting easier. Bottoms also have a triangular, enamel reference point for serial dilutions. * This item comes without lid. The analyslide is like a petri dish on a slide. Use it as an examination and storage container for 47mm filters. 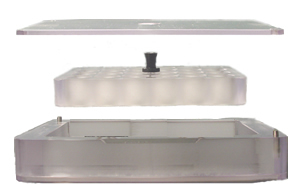 Its rectangular base fits any microscope stage; an inner cover ring offers airtight security for the samples and it does not interfere with viewing... It is also ideal for drying coated grids and absorbing water from grids that are supporting sections. A 50x9mm petri dish design that is easily opened with one hand, yet closes to a tight seal by its unique double rim. Specimen samples are preserved until you are ready to analyze them. Humidity remains locked in. When loaded with a 47mm absorbent pad, it is ideal for drying coated grids, removing water from grids that are supporting sections. Our petri dishes are available in a variety of sizes and shapes for use in routine procedures and automatic equipmentF. Manufactured from Polystyrene, with excellent optical clarity. The dishes are sterile and each lot is tested to assure uniform quality and sterility. Sterlstar Petri Dishes are designed for the Microbiologist who prefers a heavier dish. The Sterlstar dish offers easy handling, a secure grip, and additional strength. 35 x 10 mm dish for the culture of cells in suspension; radiation sterilized. Permanox is a strong, biologically inert material, resistant to nonchlorinated hydrocarbons, acetone, and many other EM reagents. Our EMbed-812 and other embedding resins can be used to embed cells in these dishes with excellent results. Permanox has not been shown to be autofluorescent, and has a low oxygen solubility which makes it suitable for experiments performed under anoxic conditions. The dishes have high optical quality that provide excellent and consistent viewing where microscopic examination is required. 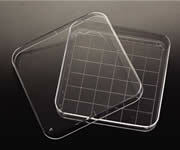 EMS introduces the High Quality Thin Glass Bottom Sterile Culture Dishes, meeting your research requirements. A new series of sterile, optical quality, glass bottom dishes which provide exceptional imaging quality for many applications requiring the use of inverted microscopes. Conventional plastic or glass petri dishes and chambers limit the use of the inverted microscope for many applications because the thick plasti or glass bottom requires a long working distance objetive available only in lower magnifications. Moreover, plastic dishes cannot be used for DIC or any polarization microscopes due to their inherent birefriengence. EMS New Glass Bottom Dishes eliminate these problems, making them ideal for applications such as patch clamp recordings where flourescent-tagged (GFP) receptors can be identified for selective study; and many other fluorescent microscopy applications, which require low background scattering of light and reduce intrinsic "auto" fluorescence that occurs when using standard plastic dishes. Furthermore, the glass bottom is designed flush with the whole base of the dish, therefore allowing direct contact between the entire glass surface and the warming stage. This eliminates any air gaps that may otherwise exist between the glass dish and the warming stage and hence optimize heat transfer, allowing homogenerous heating and cooling of the glass bottom. The WillCo-dish®KIT ("KIT") dishes, of which we have four (4) types in polystyrene (PS) and all four in both "transparent" as well as in "black walled" dishes, we designed to offer Scientists the opportunity, to use any chosen "material - as well as different thicknesses", for the bottom of a "WillCo® dish". As a standard, we offer our (German glass) Borosilicate cover slips, in Thickness: # 1.0 (130-160 micron), as well as # 1.5 (160-190 micron). The WillCo-dish® KIT Glass Bottom dishes are composed of several components, each of the highest quality of their kind. Below please find a summery and description of these components. Note: The 2 part aluminum ASSEMBLY DEVICE comes separate, because you need to purchase it only once per type, in a life time. Again, using an ASSEMBLY DEVICE with the KIT-dishes makes assembling these fine dishes "easy, accurate and safe", also saving a lot of time and funds. The (glass) bottom of the WillCo-dish® KIT dishes is always flush with the warming-stage and flat, a requirement for High Quality Imaging. All Kits are packed with dish, glass, and adhesive rings. Cellattice™ micro-ruled Plastic Cell Culture Surfaces consists of a cell culture surface with microscopic identification and measurement markers. It is manufactured with high optical quality plastic suitable for phase contrast and other standard cell-based assay measurement techniques. Cell cultures on the Cellatice™ are identifiable within 25 micrometers. The built-in markers on the Cellattice allow direct measurement of cell growth and movement without image acquisition. Same cell or cell clusters can be measured throughout the time course of the experiment, even after each incubation period. Cellatice™ can be used to monitor morphology, cell movement and differentiation at the individual cell level. Cell proliferation is measured directly with multiple reading. A two well incubation chamber for use in immunocytochemistry (by Miguel Berrios, SUNY Stony Brook). Also available in a one well version. This chamber accepts regular microscope slides or coverslips and is assembled without any bonding substrates. Antibody incubation and washing are done in the chamber wells. It is then taken apart before microscopic examination. It is a proven solution to contamination spills, non-specific fluorescent signals, and sample dehydration in indirect immunofluorescence assays. Overall measurement: 4½"(L) x 2"(W) x 7/16"(T) (113 x 51 x 12mm). Cavity: ¾" (dia.) x ¼"(D) (20mm x 6mm). Home made devices are no longer necessary. These tissue processing wells are ready to fill all of your needs with the added convenience of being able to process up to 12 tissue specimens at one time (with one unit). The Netwell™ is a polystyrene insert fitted with a polyester mesh bottom for use in 6 and 12-well plates. Available in three mesh sizes and two diameters; the Netwells provide ultimate flexibility in retaining fragile tissues during processing and staining. A set of carrier plates and handles for moving the Netwells in and out of the 6 or 12-well plates. The handle can be attached or detached to the plate at any time. Thermo-formed polystyrene. Holds 150 ml of reagent solution. Netwells are trans-ferred to the reagent tray by the Carrier kit, where fixing and staining is performed. 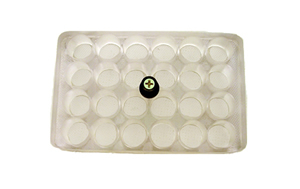 Reagent trays are available in white for colorimetric reaction contrast, and in black for better visibility of tissue sections. For your convenience, the Netwell™ Sets are available ready to use. Tissue culture plates are designed and treated for a wide range of applications. Plates are made from optically clear, medical grade polystyrene with flat bottoms of uniform thickness, allowing for distortion-free observation and microscopic examination. Alphanumeric coordinates are placed on the same focal plane as cell growth – for easy referencing of well position. These plates are also for use with our NetWells and our MeshWell Plates (see Tissue Processing Well; Net- Wells, and MeshWell Plates in our product catalog page 180). These plates are made from LEXAN™ and at the bottom of the wells is an ETFE Monofilament Screening fabric with a 500 µm (0.0197") opening. The plate comes with and fits into a LEXAN™ tray with a lid. The plate can be lifted out of the tray with the lid in place using the set screw located in the middle of the plate. These plates may be used for immunohistochemistry as well as any other procedures where you need to float sections for staining as well as for process testing for other application. The size of the inner mesh tray is 119mm (L) x 76mm (W) x 17mm (H). The complete system measures 152mm (L) x 101mm (W) x 27mm (H). These plates are made from polypropylene and the bottom of each of the wells is an ETFE monofilament screening fabric with a 500µm (0.0197") opening. These MeshWell Plates are available with 6, 12, and 24 well configurations, and they fit into the 6, 12 and 24 Costar/Corning Cell Culture Clusters listed above for processing tissue slices, otherwise, these MeshWell Plates are also able to process tissue slices with Reagent Trays (64730 - 64732). For your convenience, we offer a MeshWell Plate set which includes one MeshWell and one Cluster plate. The SureStrain™ Premium Cell Strainer system is a fast and easy-to-use solution for detaching, isolating and straining cells from clusters and tissues. A polypropylene frame supports a nylon mesh that is available in three color-coded porosities, 40µm (blue), 70µm (white) and 100µm (yellow). A tiered filtration process is made possible by the SureStrain's unique interlocking stackable design. SureStrain's molded grip and unique geometry ensure aseptic handling and eliminate the contamination risks associated with fingers contacting the filtered suspension, mesh and/or interior surfaces. The sterile strainer can be easily removed from the special blister packaging without touching its interior surface or mesh. The advanced frame/housing design also contributes to enhanced performance and reduced processing time, by eliminating the "air-lock" effect. Improved aeration allows air to escape while filtrate is entering the tube, preventing messy spillovers. 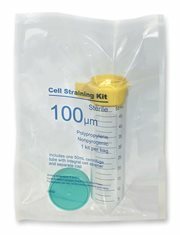 Simply open the sterile package, attach the strainer to the top of a 50 ml tube and add your cell suspension/sample. Or, attach the provided reducing adapter for use in 15 ml tubes. Sure Strain produces an optimized filtrate for maximum flow in separate columns and cytometers. ReadyStrain™ is the first product of its kind, providing all the necessary parts for filtration of cell suspensions and combining them into a single, preassembled, ready to use, sterile packet. These kits eliminate the contamination risks associated with opening multiple packages, and assembling separate pieces (i.e. tubes strainers and caps). The individual sterile packets mean researchers are no longer forced to expose entire bags of 50ml tubes and corresponding caps in order to perform one filtration. Instead they can open a single ReadyStrain packet directly under the hood. Each kit contains a sterile SureStrain™ Strainer, pre-attached to a sterile 50ml tube, with a separate sterile screw-cap ready for assembly, processing and storage after the filtration is complete. 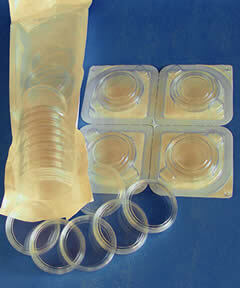 Kits are supplied in easy open "tear-strip" bags and gamma sterilized. These nylon meshed devices provide more uniform cell suspensions, and are a perfect tool for separating cells from either clumps or primary tissues. There is no longer a need to fabricate filters from gauze, cotton, paper or fabric. Cell strainers are compatible with 50 ml conical tubes (#64760 or #64762). The strainers are available in 35, 40, 70 and 100 micron sizes. The 35 micron mesh comes in a sterile configuration and it is an integral part of the 6ml tube cap that can be used to collect the dissociated sample for downstream processing in instruments. Ideal for dissociating clumped cells in separation for cell counting or sub-culture, separating enzymatically dissociated cells from undigested tissue for the initiation of primary cell growing, tissue processing such as fixation, dehydration, and staining. Each strainer is individually wrapped and gamma sterilized, except for the 35-micron mesh which comes sterilized with a 6ml tube and is bulk-packed 25 per pack. Disposible Cell Strainers for P1000 pipette tips (40 microns). These unique cell strainers provide quick and efficient filtering of small volume samples (up to 1000µl) prior to FLOW or FACS Analysis. ** FLOWMI™ is compatible with most 1000µl tips including Fisherbrand Sure-One, VWR brand, Axygen, Nichiryo, Eppendorf, and more. FLOWMI™ strainers are sterile and packaged in re-sealable, zip-style bag. Product sterility can be maintained when opened and re-sealed in a laminar flow hood. 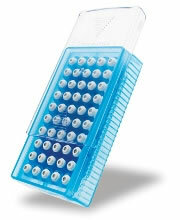 Compact, covered tray holds 50 FLOWMI™ strainers oriented for direct press and fit attachment to the pipette tip. ** FLOWMI™ is recommended for use with samples having a maximum concentration of 2MM cells/ml. This device operates on a piezoelectric effect to emit positive (trigger squeeze) and negative (trigger release) charges to neutralize static on virtually any surface. The gun remits no radioactivity and it does not require electricity or batteries. The unit measures 4" x 6".